Sam Mayer developed a love for speed at a young age, watching his dad, former Indy Car and Grand-Am driver, Scott Mayer, race the track. Sam quickly proved a natural on the track, officially starting his rookie racing career at the early age of four when he began racing the Kid Karts at Badger Raceway. Now, at the age of 15, Sam is quickly making a name for himself. He secured a standout season in 2017, winning a full slate of U.S. Legend Cars Series events, including the U.S. Legend Cars Winter Heat Championship, the Bojangles’ Summer Shootout, U.S. Legend Cars Asphalt Nationals and was crowned Young Lions Legend Cars National Champion. His accomplishments included the youngest driver to ever win a Late Model race at the historic Greenville Pickens Speedway and a fifth-place finish in the prestigious Myrtle Beach 400. In 2018, Sam joined Dale Earnhardt Jr.’s JR Motorsports’ championship-winning Late Model program for the season. He started strong with consistent top-five finishes and a second-place finish in the World Series of Asphalt Racing Super Late Model Championship with Fury Motorsports. He also won the 2018 Bojangles Summer Shootout title at Charlotte Motor Speedway and competed in both the NASCAR K&N Pro Series and the ARCA Racing Series, including two top-five and five top-10 finishes. In his first run at Wake County Speedway he was aiming to place in the top ten but ended up taking home his first CARS Tour victory! He ended the 2018 season as the highest finishing rookie in the 2018 CARS Response Energy Tour late model championship standings. Sam was also voted the series’ Most Popular Driver following a poll conducted by Race22.com. 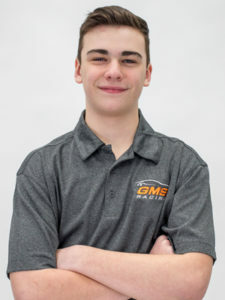 For the 2019 season, Sam will be racing in the ARCA Racing Series and K&N Pro Series East racing circuits. When Sam isn’t racing, he enjoys practicing and racing karts at home on the 1/2 mile backyard paved road course. He also watches races on TV and plays racing video games, including iRacing. Other passions include watching football, hanging out with friends, and spending time with his family and their four dogs.